how to use GIS in your work - needs assessments, research, communication, operations, evaluation, etc. No question is too big or too small! And while we may not be able to answer every question, we will either find out or point you in the right direction. To help ensure we have the best person available to talk with you, we ask that you please sign-up for a time slot, with a brief description of your topic or question. Zoom connection information will be sent when you sign-up. Can't make Monday afternoons? Choose 'Other' as the time slot when you sign-up, and we'll contact you to set up an alternative time. Have a slow Internet connection? No problem, you can turn your web-cam off or simply phone-in. I must confess when I first thought about a GIS-themed poster for the California Naturalist conference last weekend, the two topics seemed like somewhat odd bedfellows. 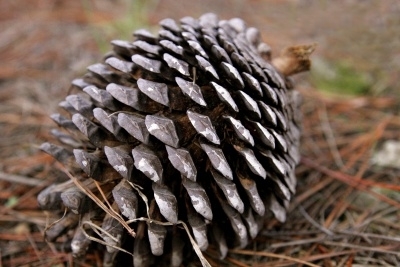 The central character of naturalists, it seemed to me, is a deep-seated passion for nature, rooted in direct experiences in the outdoors, keen powers of observation, and lots of reflection on the connections to our deeper selves, our personal and collective histories, and our communities. The big insights from GIS, on the other hand, stem from slicing and dicing the real world into abstracted layers that can be stored, shared, and manipulated in a digital realm. How could these two vastly different ways of knowing, epistemologies if you will, complement each other? At best I thought GIS might be useful to make navigation maps to help naturalists find their way through a forest. At worst, I thought the technological mediation of experience that GIS brings to bear could dilute the essence of what draws people to natural history. At this level, a cell phone app may not be what you want to record or structure your thoughts. However I also saw that many of the questions that come out of observations and reflection are exactly the kinds of questions that GIS shines in answering. What is the history of this thing? Why is it here? Where else is it found? And how is it connected to the things around it? Natural history has been around much longer than GIS, but already there are some spectacular examples of technology enabling the work of naturalists. 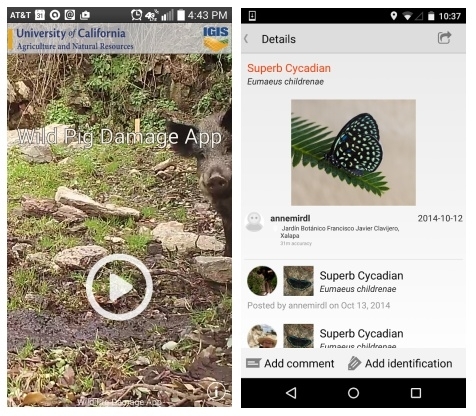 The mobile app iNaturalist shines in this space, because it not only is an incredibly useful tool for recording observations, but also extends the value of making observations by creating connections across a vast online community of other naturalists. Nature watchers can learn from each other, as well as aggregate their observations so the whole becomes greater than the sum of the parts. In bringing people and data together, iNaturalist is a good example of what is more generically known as community and citizen science, of which there are hundreds of examples. 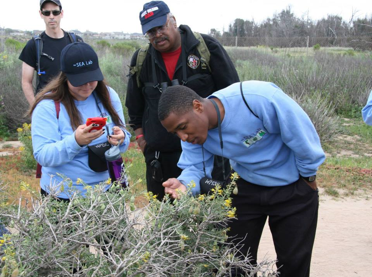 The CalNat conference featured several presentations about citizen science, which highlighted another connection between naturalists and technology -- in many cases citizen science has provided the motivation or on-ramp for people to venture into the field in the first place. Guided to a meadow or wetland by a citizen science program, they can then develop observation, curiosity, and connection which are the hallmarks of naturalists. Seeing things at different scales is another part of GIS, and large scale datasets such as satellite images or topo maps can highlight patterns and relationships not visible from a worms-eye view. GIS is also a good tool to “see” important characteristics that are not visible to the naked eye, such as the annual temperature range, precipitation levels, or soil types. Naturalists are also curious about the history of species, and how thing will change in the future. Through GIS, we can access the observations of naturalists who went before us, such as the Wieslander photos and vegetation maps from the 1920s and 30s. To some degree we can also “see” into the future, using tools like Cal-Adapt or the California Climate Console, which present different models of the impacts of climate change. Wieslander's photo of French Lake and English Mt. looking north, morphing into 2014 photo by Joyce Gross. Wieslander's photo shows a large area of barren and semi-barren oak. One of the most thought-provoking talks during the conference was given by Charles Convis from ESRI, the makers of the popular ArcGIS software. Convis has a unique perspective on the connection between naturalists and GIS, with a degree in Natural History from UC Santa Cruz and almost three decades at the helm of the ESRI Conservation Program. His talk wove together anecdotes from his own history with reflections on how landscape images and mapping have precipitated paradigm shifts over time, and the evolution of GIS. I was intrigued by an ambitious metaphor Charles made when he argued that GIS is “the Calculus of Natural History and Landscape Ecology”. 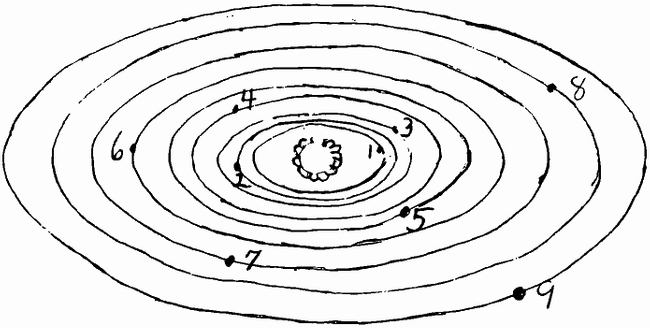 What he meant by this was that in the same way that Newton's invention of calculus made all sorts of observational data about the planets fit together under one paradigm, GIS is a tool and way of thinking that can bring together many types of environmental data, questions, and models under one roof. I like this way of thinking, because draws attention to GIS as both a conceptual paradigm that connects diverse environmental data and questions through simple but powerful principles (things are situated in space and time, there are different types of connectivity, close things tend to be more related than distant things, etc. ), as well as GIS as an increasingly powerful set of tools that can store, manipulate, fuse, analyze, and visualize many types of data. I saw a great example of the unifying power of GIS during a conference field trip to the Santa Ana River watershed, where we learned about a Habitat Conservation Plan for the upper part of the watershed. Heather Dyer from the San Bernardino Valley Municipal Water District and Jeff Beehler from the San Bernardino Valley Water Conservation District took us on a tour of the watershed and described the very long but ultimately fruitful effort to develop a HCP that will allow the water utility to continue managing the watershed for groundwater recharge and flood protection, while also protecting endangered species and allowing for other uses including recreation and transportation. 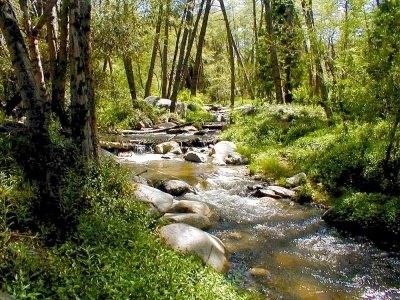 Successful collaboration around water and endangered species is a rarity in California, but in this case was made possible by some enlightened thinking on the part of the utilities, a handful of strong leaders in key agencies, lots and lots of dialogue, and craftful application of the carrots and sticks in the ESA. However they also told us it also would not have been possible without GIS, which became the main tool for planning and communication (the calculus if you will). The process of assembling and collecting new spatial data was itself collaborative, and built relationships among the stakeholders that provided a foundation for the more difficult conversations about tradeoffs and compromises. In the coming months as the HCP begins a formal review process, the groups will release the geodatabase behind the HCP, which will enable additional updates, analyses, and discussions. We should always be reflective about how technology is affecting our work and lives, but the California Naturalist conference gave me a lot of insights about how GIS and online tools can be used to enhance the work of naturalists, expand their vision, and broaden their communities. If you have other ideas or examples of how naturalists have productively used (or could use) mapping technologies, we would love to read about it in the comments. I recently attended a really useful ANR training from the office of Program Planning and Evaluation (PPE) on needs assessment. Incorporating needs assessments into research and extension makes a lot of sense for many reasons. We all want to address issues and problems that are significant and pressing, and develop programs that are effective. A needs assessment can help flush out the challenges in our areas, prioritize needs, and build relationships with key stakeholders. As stewards of public resources, we also want our programs to be as efficient as possible. ANR expects all program staff to do needs assessments as part of program development, and the PPE has put together a great set of training and resources. A needs assessment often requires talking to people in the program area, which can be daunting because we work with a lot of people. GIS maps can sometimes provide a sampling frame, in other words a master list of all the potential people one might want to talk to. For example Margaret Lloyd, Small Farms Advisor for Sacramento and Yolo Counties, described how a Google Map of strawberry farm stalls in Sacramento County was the starting point for a needs assessment tour of strawberry growers. In other cases, you may get a spreadsheet of growers' addresses in a county. These can be turned to points on a map with GIS using a process called geocoding. This can be particularly helpful to an Advisor who is new to an area. If there are more stakeholders than one can personally contact (often the case), taking a sub-sample may be a practical necessity. A simple random sample is easy to do, but a GIS also allows spatial sampling. This could be useful, for example, if you want to ensure an even geographic distribution across the county, or a distribution across other units, such as watersheds, municipalities, school districts, etc. Even if sampling is more opportunistic (e.g., meeting attendees), a map can show the distribution of the people you talked to, so you can tell if any areas were over or under represented. 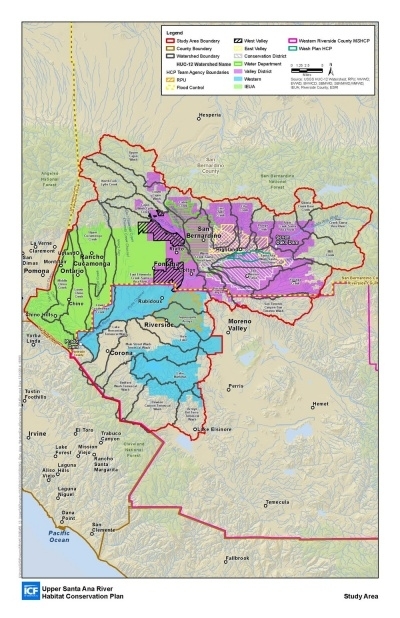 Maps from a GIS can be an effective way to communicate the results of a needs assessment. Whether a simple map in a report, or an interactive web map, maps can show a lot of information at once by manipulating the size, shape, and color of symbols. Geographic patterns jump out in a way you don't get in a table or regression coefficients. With a little more work, the data you collect can be enriched with other useful datasets, such as census or environmental data. Imagine for example displaying the results of an email survey in a map form, overlaid for example with a map layer showing food security, or climate vulnerability. This type of fusion is helpful not only for understanding the nitty-gritty of the challenge, but also opportunities for extension and collaboration. 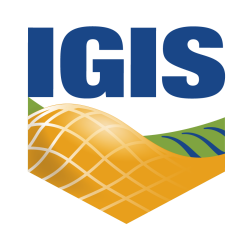 Incorporating GIS in a needs assessment may be a little more work for those who aren't familiar with the technology (but see the services offered by IGIS below), however this investment can pave the way for all sorts of additional outreach and analysis. Putting your baseline data in a GIS simplifies ongoing monitoring and tracking, so you can see if your efforts are working. It also enables further technical analyses, such as testing spatially explicit models of a process, which can help you publish your work. On the non-technical side, getting your data into GIS formats dramatically simplifies the process of developing innovative communication tools down the road, such as story maps or web GIS. Not everyone in ANR has a lot of experience with the rapidly changing world of GIS, but the good news is that help is a click away. The IGIS statewide program is here to serve the Division, and we love working with Advisors, Specialists, and all the Statewide Programs. If you need software, we can provide ANR staff with software licenses for ESRI GIS software, including the new ArcGIS Pro (at no cost!). We can also point you to open-source GIS software, if you prefer that. Don't know how to use it? We run a series of GIS workshops tailored to specific fields. If you would rather go straight to web mapping, we can set you up with an ArcGIS online account so you can do it yourself, or potentially make a web map for you. Need data? We can help you sift through the massive amount of publicly available GIS data, or help you create a mobile app to collect it yourself. Browse through our gallery of web GIS projects for inspiration, read the service center FAQs, and then submit a service center request and we'll call you back in a day or two.